Thomond Village is located on the North Campus which is linked to the South Campus by means of a spectacular bridge across the river Shannon. 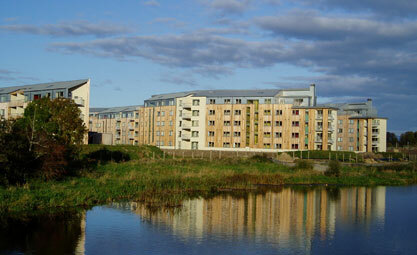 Thomond Village offers 2/4/6 bedroom apartments with stunning views of the river Shannon and the Errina Canal. All bedrooms offer ensuite bathrooms. The village has its own launderette and study hub. All villages have a mix of students in the community, first year, seniors, international students and postgraduate students. Number of rooms 470. To view a campus map click here. Thomond Village is a non smoking residence.